Introducing the EVGA GeForce GTX TITAN X HYBRID, an "all in one" water cooling solution that significantly lowers the GPU operating temperature. Best of all? The water cooler is completely self-contained, with an included 120mm radiator and fan. No filling, no custom tubing, no maintenance. Just plug in and play! The EVGA GeForce GTX TITAN X HYBRID is available as a complete unit, or upgrade kit. The NVIDIA GeForce GTX TITAN X GPU combines the technologies and performance of the new NVIDIA Maxwell architecture in the fastest and most advanced graphics card on the planet. This incredible GPU delivers unrivaled graphics, acoustic, thermal and power-efficient performance. The most demanding enthusiast can now experience extreme resolutions up to 4K-and beyond. Built on Maxwell - The EVGA GeForce GTX TITAN X HYBRID features the most advanced GPU architecture ever made, designed to be the engine of next-generation gaming. Hydro Performance without the Hassle - All in one cooling solution that is completely self-contained. No filling, no custom tubing, no maintenance. Just plug and play. Sleek Looks - Intelligent wiring system and sleeved tubing make this one sleek cooler without the messy wires. Copper Base - Provide maximum heat transfer. Virtually Silent Operation - Variable controlled fans allow dynamic fan speed based on GPU temperature, and water cooling efficiency means very low noise fans. Built in Radiator and Fan - Built in 120mm radiator and fan helps dissipate the heat, keeping the GPU as cool as possible. Fan can also be swapped or customized. Cooling for VRM and Memory - VRM and Memory cooling solution separated from GPU, allowing for lowest GPU temperatures, and efficient VRM and Memory cooling. 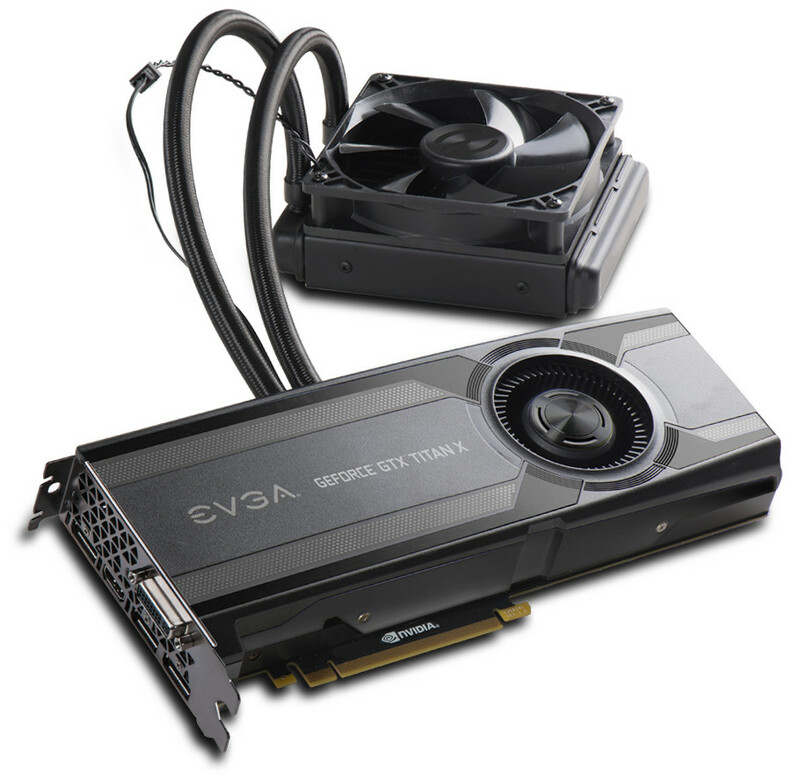 Learn more about the EVGA GeForce GTX TITAN X HYBRID here.